← Hindsight Helps Produce Waterproof Historic Roof Designs. True Historic Wrought Iron is Not What You Think. ALL NATURAL. These exterior pickets show how layers of tonal clear finish can accentuate the underlying colors of the steel, causing the shifting daylight to play upon the natural color of the steel, from gray to bronze to black, while minimizing any reflective glare from the surface of the coating. Development of ferrous metals technology and misleading new usages of the term “wrought iron” have created confusion about the equivalence of today’s commercially available architectural iron, known as mild steel, and true historic “wrought iron”. Replacements in mild steel are fated to a short, ugly career if it is assumed that measures sufficient to protect the original historic work will be adequate for the replicated elements. While these metals can both be “wrought” (archaic for “worked”, according to Webster) by the smith, true historic “wrought iron”, earned its name not on the blacksmith’s anvil at all but in the smelting process itself! Modern mild steel is a high carbon steel possessed of an urge to recombine with oxygen and to return to its natural state, iron oxide, as rapidly as possible. True historic “wrought iron” is a stable very low carbon iron that is capable of standing centuries to the elements as long as its surfaces are well drained and ventilated. Carbon atoms, it turns out, are the constituent element that induce ferrous metals to crave oxygen. 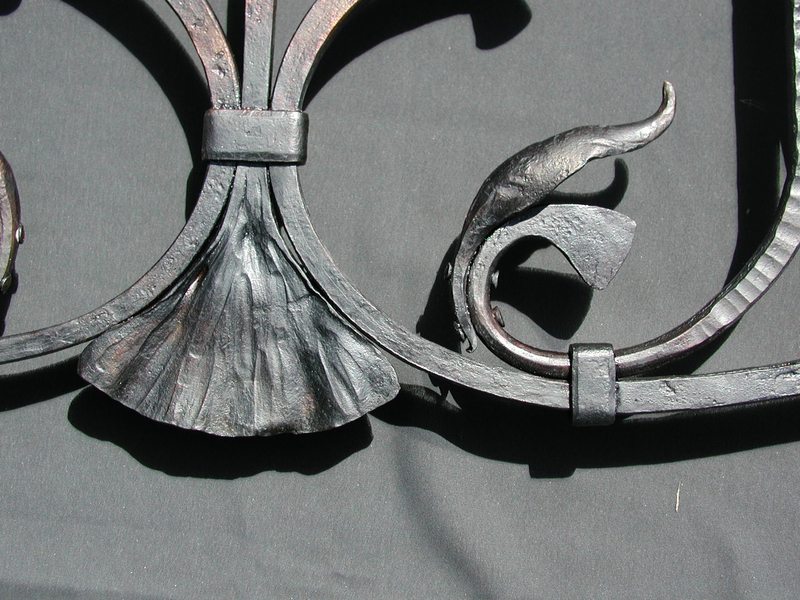 In general, true historic “wrought iron” was smelted at relatively low, sub-molten temperatures and then “wrought”, hammered while yet a red hot solid to beat out impurities. These low temperatures result in a carbon content of about one twentieth that of mild steel. At higher temperatures, more carbon from the fuel is incorporated into the metal which both increases the strength of the material (good for structural applications) and the rate at which the metal will oxidize. So while true historic “wrought iron” will indeed rust, it does so without the reckless enthusiasm of mild steel. With all its virtues, however, true historic “wrought iron” has one very serious drawback and that is availability or, rather, a virtual lack of it. It is an archaic material that is simply not being produced anywhere on any scale. The prevalent manufacturing technology from the dawn of the Iron Age through the eighteenth century, the nineteenth century saw it gradually supplanted until the last commercial “puddle furnace” went cold around the middle of the twentieth. Salvaged material can still be located and there is some commercial remanufacturing of salvage being conducted in Europe. Specification of salvaged or imported material is not totally unfeasible but it will seriously impact construction budgets and schedules and will therefore not be acceptable for many projects. It seems incredible that such a durable building material can no longer find a steady market, but the world has moved on and we must consider all of the alternatives it leaves. IRON SPECTRUM. Here, a colorful side of the personality of low carbon iron is shown in an interior application. This “pure iron” grille displays a range of color produced by the heat of the forge and preserved under a matte clear topcoat. 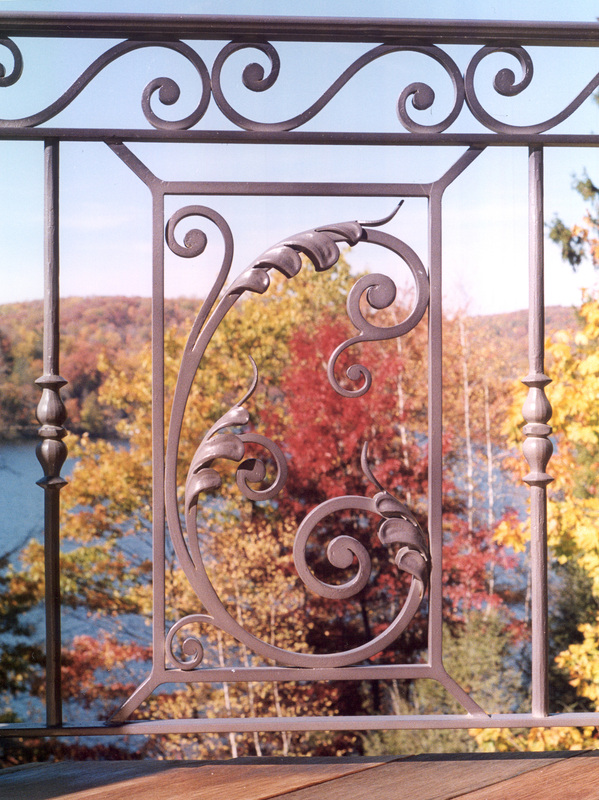 To discover what effective measures can be taken to extend the life of ornamental iron work created in the materials available, we talked to the late Ed Mack, who worked as an award winning architectural blacksmith and lead artisan at Fine Architectural Metalsmiths in Florida, NY. Mr. Mack assured us that between strategic design measures and the application of the latest coating technologies that we can have full confidence in the performance of new work. Hot dipped galvanized coating is a very effective and long established measure although one not always feasible for work of great size, of fine detail or for technical considerations. In these cases, Mr. Mack had particular success in sealing traditional type iron finishes under a clear or tinted durable “automotive” type finish. Hot applied finishes such as gun bluing, stove polish, peanut oil or graphite all lend themselves to this application. These are traditional iron finishes normally not considered durable in exterior applications but which can now be enjoyed outside as well as indoors. Metal pastes and mixtures designed to produce patinas, such as a mixture he used of hydrogen peroxide, salt and vinegar, can also be applied and then given a long life under such coatings. The coatings are themselves extremely versatile and can be built up to create color and an illusion of depth. For example, he had recently created a very effective faux bronze finish for an iron fence and gate system located in a coastal environment subject to salt and blown sand. Beyond these “automotive” type finishes, he noted that powder coating and metalizing coating systems have begun to offer a wider range of colors and options as well. This exciting and growing new palette of finish options was totally unimaginable just a short time ago. Mr. Mack cautioned, however, against making it all sound too easy. These finishes must be carefully researched and tested before application. Casual planning can result in disaster if a failed coating has to be removed from every surface. In general, these high tech coatings must be applied in carefully controlled environments previous to installation. In every case, the success of the application will depend on the most diligent and scrupulous preparation of the surface. All fire scale (slag) and mill scale must be removed from the surface by mechanical means such as sandblasting or wire brushing. Mill oils need to be removed with an appropriate solvent. Depending on the coating, it may be necessary to etch the surface with acid taking care to neutralize the surface afterwards. If mechanical assembly is to take place before coating, care must be taken to prepare and pre-prime all parts of the mated surfaces so rust won’t have a chance to originate in these inaccessible areas. The artisan is always prepared to design details which will shed the elements most efficiently or to select a material to perform a specialized function. Ironwork is the darkest of the building arts with historic origins in magic and shamanism. No longer a magician, perhaps, the skilled architectural blacksmith remains a diligent student of arcane and diverse technologies, antique and modern, and can help to design the most durability available into the work. As another example, Mr. Mack salvaged a section of a severely damaged true historic “wrought iron” fence (it had been run over by a dump truck) to build latches and hinges for the replacement work. These are the areas least coatable and most vulnerable to rust because of their hidden abrading surfaces and thus best served by selective incorporation of the historic low carbon material. The balance of the work was wrought in mild steel and protected with state of the art coatings. Mr. Mack had observed that historic work is best served when intimate expertise with the materials is incorporated into the design process at the very beginning. List of Metalworkers in Iron. This entry was posted in Wrought Iron and tagged Metal Fabrication, New York. Bookmark the permalink.